Awesome foiling conditions, 20-24 knot SW, 2m windswell offshore. Surprised how easily the 4m wavesail cranked back upwind. One of the most enjoyable sails in a while. Cruisy fun in the sun with a a few Pinnas out. The combo felt about right for today. Nothing special but always nice to get out on a seabreeze. Good to see Woodie back on the water. Pinna fest, woody back on the water, Lunny and Tim sailing outer side of Melville. More of the same for me figure 8's bit less wind than yesterday but was still a lot of fun. Oh and where has the water gone? Did Fangy send his Tele Tubbies to pull the plug? Went downwind to Peli pt then it seemed to take ages to get back upwind compared to the foil. Saw Neil out there a few times blatting out a few wooohooo's, clearly having a ball. Great little after work sail, but better than the sail was catching up with a lot of folks I hadn't seen in quite a while. Bit of slalom practise around the buoys today, and was nicely lit once I changed up to the 7.1 and put on the 4kg of lead. Had a 31knot 500m, probably should have tried for a mile in the end, but was enjoying the blasting back and forth too much to bother. Might be a rest day tomorrow, feet a little sore after the last week. 98 was much easier to handle with the 34cm fin after putting on the lead - probably should have had the 31 Tribal WS in there instead today, but was excited at the prospect of using a pointer for once!! Been a while since I sailed a Peli. Pretty constant 19-23 knots. Forgot how much better the wind is compared to melville but forgot how bumpy it can get. A little pinna party at Peli. 6.2 Reflex, 91 mistral, 25 tribal ws. With the end of the month approaching I thought I would have a go at improving my nautical mile for the month. Unfortunately very low tides and heavy weed infestations and poor wind forecasts ruled out most of the usual nautical mile runs. I asked around for a few creative ideas of where a 27 knot nauti might be doable and the idea which won was Pelican Point. Thanks everyone for your ideas. There were some very creative ones, including Leighton. I hate the chop at Pelican Point but at least there was enough wind there, and nothing ventured, nothing gained. I thought if I could get up enough speed before hitting the deep I could just run down the swell lines for the rest of the distance. Seabreeze was indicating 20 knots, so I rigged 5.7. 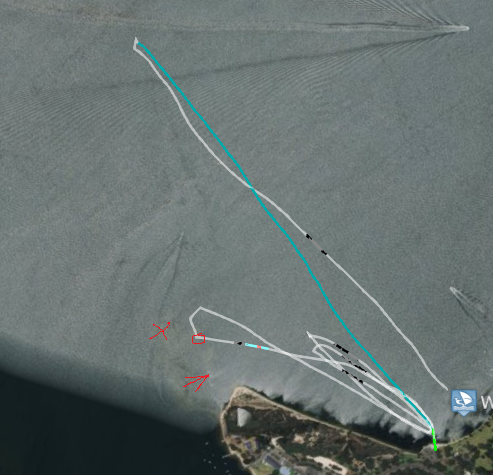 That proved to be a bit underdone on the first few runs and I gave up on the nauti idea, then on the next run I was doing 25 knots across the wind (GPS logit was talking to me for once) and I thought I would bear away and try to pick up some speed. I was doing 28, 29 knots for quite a way in relatively smooth water and the channel marker was not far off. "I am in good shape here", I was thinking, then BLAT! I was very surprised to hit a shallow spot that far out, and I was only running a 23 fin and planing well, so it was very shallow. The 500 m was 27.9 so I was doing well up to that point. Darn those low spring tides! I think yesterday (with 10 cm more water) I could have made it. Such is life. I did a few more runs to loosen up the muscles after the catapult but then decided to call it a day. Sometimes "Nothing ventured, nothing injured" is a better motto. Maybe I'll use that one in future. It was great to catch up with a lovely group of teammates and others. A wonderful team turnout on both sides of the river, and so far we are still #1 for October... Top sailing everyone! The square is where I came to a dead stop at 28 knots and was catapulted into the shallows. It looks like there is a little line of shoals where the arrow is. I guess that is what tripped me up. Nice nauti Neil. I'd have been very happy with that. Pretty weird Anita. Not sure what's going on with my watch. All those times that you saw came from somewhere?? There is no record on the watch of my posted numbers. When I was sailing I kept looking and seeing 29's or less? Something fishy going on here? You were shredding out there Johnson...it's on the news tonight. Awesome mile, Neil! Must have been that run I saw you do where you seemed to smoke downwind! That was a hoot out there Lunny for sure. Nicely powered, sun, clear skies and a spring suit. Good to see you . Great speed for a lighty in chop too. That�s not good Anita, hope you�re not too sore. Time for a shorter fin? I am a bit sore today through the upper back but not too bad. The worst part is I lost my prescription sunnies in the catapult, and didn't realise until I had sailed away. Bugger re the sunnies! I hate that.. I have a hole drilled in the arm by the optometrist and tie a sunglass tie to that with fishing line. I tie the other end to my vest so even if they fly off my face I don't lose them..After one $500 loss I figured this idea out pretty quickly..